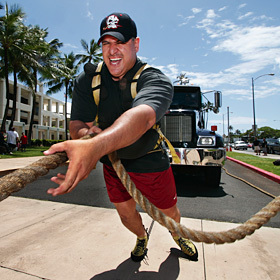 ~30,000 POUND HAUL » Darren Kaupu (who weighs 305 pounds) strained to pull the truck and Hummer on Saturday as a test run for the upcoming Hawaii's Strongest Man Competition. With the support of legislators and now the state Health Department, a law allowing the placenta to be released to birth parents in Hawaii awaits the governor's signature. The team reports preliminary evidence of an interstellar wind blowing past the sun. Kids publish books for other kids under a program that promotes literacy and imagination. Hawaii's baseball game at Nevada likely won't be rescheduled. Debbie Scanlan-Maluina has a job that is exciting and fun but also deadly serious. The Army has reversed a decision to close a criminal proceeding to the public.